IMACS students Hadley and Delaney Robertson with their winning robotics project. You might recognize twin sisters Hadley and Delaney Robertson from their cooking show for kids, Twice as Good, that airs on PBS stations across the country. We at IMACS also have the pleasure of knowing them as two intelligent and delightful students who have been attending our Math Enrichment classes since they were in kindergarten. "IMACS has provided Hadley and Delaney with such an amazing mathematical foundation," their father, Johnathan, recently shared with us. 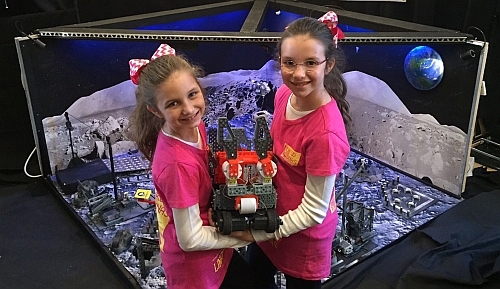 And we are beyond thrilled to share that these talented girls were just named grand prize winners in the 2015 MOONBOTS Challenge! The international MOONBOTS competition, also known as the "Google Lunar XPRIZE for Kids," is designed to encourage the next generation of space explorers and innovators. Kids ages 8-17 are invited to design, create and program their own lunar rover, based on a legend or theory that inspires them about the moon. This year 235 teams from 29 countries entered the competition, and the Linked Lunas team comprised of Hadley and Delaney won! As grand prize winners, they will travel to Japan to meet the Google Lunar XPRIZE teams that are competing to land a privately funded robot on the moon. 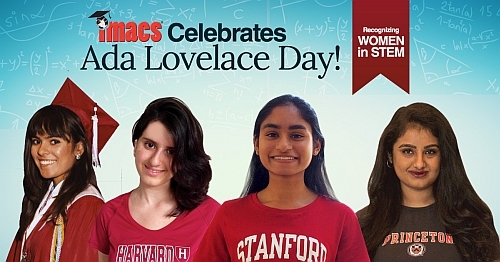 Everyone at IMACS is so proud of these remarkable girls. There is no doubt that Hadley and Delaney have a talent for math and science and love inspiring others to learn. The cooking show Twice as Good has produced 20 fun videos that explain how cooking can teach kids about nutrition as well as science, math, and geography. Share these with your children and maybe they, too, will be encouraged to shoot for the moon! IMACS gives budding scientists and engineers an outstanding mathematical foundation with Math Enrichment and Computer Programming classes for talented children. Like IMACS on Facebook for the latest information about our local classes and online courses.